I needed little convincing when this one came up for review. The cover is beautiful and it’s set in pre war Italy. It was an easy yes for me. I didn’t know that this book was part of a series when I agreed, and honestly I don’t think that it mattered too much with this one. Sure there is a backstory between Liam and Catherine, but the heart of the book is the mystery and the historical details of Ada’s plot line. What became of Ada? How is she connected to the conflicting land deeds of a small Italian villa? As they dig through the layers of lies, corruption, and human evil, Catherine and Liam uncover an unfinished story of heart, redemption, and hope―the ending of which is yet to be written (summary from Goodreads). This book should have been a quick read for me but I confess, I struggled and didn’t read it nearly as quickly as I had hoped. The plot crosses between 2017 and the 1930s, and while I loved the 1930s part, the modern period was wanting for me. Ada’s story is where Balson shines. The history and depth of feelings that the characters are feeling are finely drawn and interesting. But when we shift back to the modern period, the shine of history dissolves leaving the reader feeling a little disappointed. Ada’s story is interesting and inviting. I can only imagine what it would have been like for a young girl growing up in Berlin at the rise of Nazi Germany’s power. I loved how elegantly the music was woven into the plot. Balson is a strong writer when it comes to weaving history and mystery together, but I personally felt like the modern period just needed something more—-though I am not sure what, I just felt like it needed something else to make it balance with the beauty of the historical period. Writing in two periods can sometimes be a challenge. 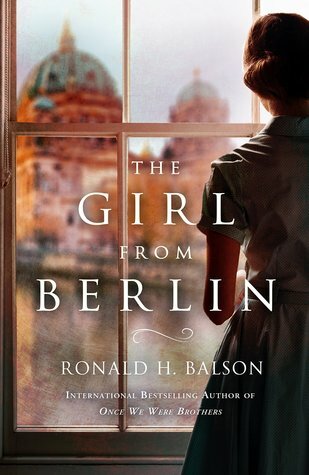 Having not read any other books by Balson, I don’t really have a comparison or reference to his ability to blend the two, but this novel just felt like an unbalanced to me when it came to richness in plot both historic and modern. I enjoyed Ada’s story and uncovering the mystery—-for me this was a good novel—-not great but entertaining. I just didn’t love it in the way that I had hoped.